Will Foxconn’s Manufacturing Promises in Wisconsin Prove to Be a Con? On July 26, President Donald Trump announced that Foxconn Technology Group, the Taiwanese manufacturing giant, will establish an LCD screen production facility at an undetermined location in southeastern Wisconsin. 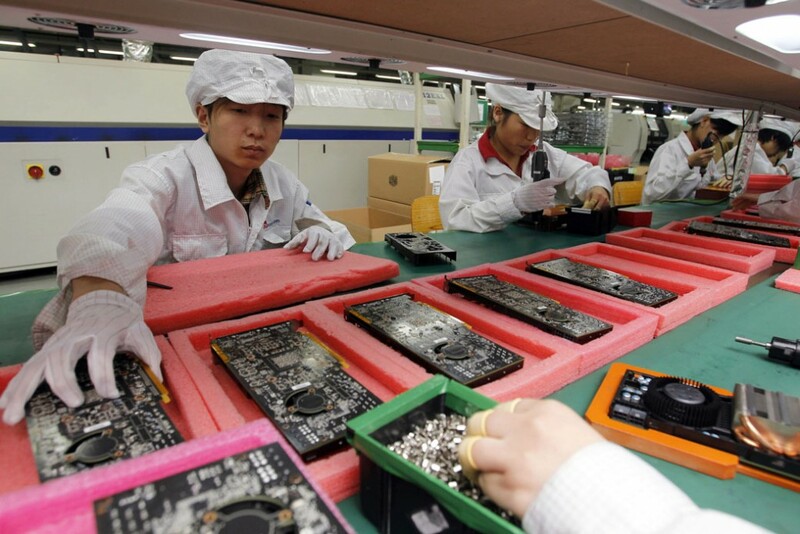 Foxconn—best known for producing iPhones, Kindles, and other consumer electronics devices—claims that it will invest $10 billion in Wisconsin, as well as bring 3,000 to 13,000 new jobs. The buildup to the president’s announcement, however, seems to have happened largely outside his purview, with Wisconsin Gov. Scott Walker (R) taking the lead. Despite other suitors, including states such as Texas, Ohio, and Michigan, a courtship quickly developed with Wisconsin this spring as Gov. Walker enticed Foxconn to choose his state. Wisconsin is clearly an appealing location for Foxconn. Manufacturing is already a top industry in the state, and ready transportation via water, air, rail, and highways makes moving people and goods economical. The population centers of Milwaukee and nearby Chicago offer a strong supply of workers. Finally, situating the facility near Lake Michigan will allow for access to a plentiful supply of water, crucial to the dust-free environment needed for electronics manufacturing. Yet these inherent advantages are apparently not sufficient for Foxconn or the state. Although many details of the agreement memorandum of understanding—such as enforcement mechanisms, job and salary requirements, and tax credit payment structures—remain shrouded in secrecy, the Wisconsin Legislature is expected to consider a bill that creates massive financial benefits exclusively for the company—even though it has a history of failing to meet its promises. Further, the company’s Wisconsin activities would likely loosen environmental standards and weaken the state’s tradition of good governance practices. The deal’s headline figure is the $2.85 billion it would make available in refundable tax credits over 15 years for businesses in a newly created “electronics and information technology manufacturing zone.” The bill establishes this zone specifically for Foxconn. In addition to job creation credits and capital investment credits, Wisconsin has an existing tax credit for manufacturing businesses that “virtually eliminates the tax on income from manufacturing activity.” The state’s effective corporate tax rate for manufacturers is now 0.4 percent, compared with the statutory rate of 7.9 percent. With existing tax breaks already reducing Foxconn’s taxes, refundable tax credits mean that the company would likely receive substantial amounts of money directly from the state. The bill also offers exemptions for state sales taxes related to building materials, supplies, and equipment for any property within the zone. This exemption could be worth as much as $150 million. The divergence between Foxconn’s investment promises and reality is striking. Previously announced investments in Pennsylvania and Jakarta, Indonesia, have yet to materialize, and other commitments in India, Vietnam, and Brazil have underwhelmed. The proposed $10 billion investment in just Wisconsin is more than the company’s combined total purchases or improvements to land, buildings, and machines between 2012 and 2016, suggesting a major shift from Foxconn’s capital investment strategy. According to calculations from the Wisconsin Budget Project, the company will receive more than $17,200 per employee per year. Promotional materials give an average salary of $53,875, an oddly specific number for a company that has yet to put a shovel in Wisconsin ground. Moreover, an average salary can be quickly skewed by the addition of a handful of highly compensated executives or plant managers. With the Wisconsin bill, Foxconn would benefit from specific carve outs that could harm the local environment. During both construction and operation of its facility, Foxconn would have lax permitting requirements for discharging dredging material, filling wetlands, and ensuring water quality. In certain streams, small lakes, and areas of special interest, Foxconn and its related parties could deposit materials, construct bridges or culverts, modify adjacent artificial bodies of water, remove topsoil, and alter the natural course of streams, all without needing any state approval. Plus, the bill would exempt Foxconn from supplying an environmental impact statement prior to receiving state approval for a new facility. Bypassing a thorough analysis of environmental risks is worrisome, as the electronics manufacturing process involves acids, volatile organic compounds, and other hazardous chemicals, and the company’s past environmental practices have been a focus of Chinese regulators. Since no specific location for the manufacturing zone has been determined, legislators would not even know the potential scope of environmental damage until after they had decided to weaken state protections. The Foxconn project would also require expanding existing public utilities and building new infrastructure. Unfortunately, the bill’s authors have needlessly structured provisions to limit state oversight and erode public trust. For months, Gov. Walker and legislators in the Republican-controlled Wisconsin Senate and Assembly have been at odds over the appropriate level of state borrowing for highway projects. This has led to an ongoing delay of the biennial budget. Yet the Foxconn bill would allow the state to add $252 million in new debt for Interstate 94, which runs between Milwaukee and the Illinois border. The manufacturing zone’s likeliest locations would place it near I-94, allowing easy access for freight traffic, but prioritizing a project based on backroom negotiations prevents a transparent process and decreases the likelihood of good public policy. Further, the bill specifies that new public utility projects and transmission line relocation do not need approval from the Public Service Commission, the sole function of which is to regulate utilities on behalf of the public interest. This means that if a local jurisdiction in the manufacturing zone needed new water and wastewater systems and facilities, it would not be required to go through the traditional public works bidding process. Circumventing the evaluation of bids limits transparency, inviting the potential for cronyism and cost overruns. The prospect of thousands of new jobs is understandably alluring for Wisconsin: It’s August 2017, and Gov. Walker is still working toward his 2010 campaign pledge of 250,000 new jobs in four years. But the enormous costs that this new bill unnecessarily demands would hurt Wisconsinites far more than they would help them. The state does not need to sacrifice the environment or eliminate public oversight in order to stimulate economic development. Money given to a foreign company as tax incentives is money that is not used to support small Wisconsin-owned manufacturers throughout the state or other essential services that a state provides to its citizens. If this costly deal is the better option for Wisconsin taxpayers, then the burden of proof should lie with its proponents. Legislators would be wise to study the implications of this bill carefully and consider what may happen if the deal fails to live up to its hype. Andrew Schwartz is a policy analyst on the Economic Policy team at the Center for American Progress.